The interesting thing is I’ve been plotting this for 33 years. When I was a junior in high school, we were going on a field trip to New York City. At that time I was gaga for anything NYC, partly because I grew up in a town with fewer than 10,000 residents—and that included cows, chicken, cats, dogs, and guinea pigs. And partly because I wanted to be an actor. Although I lived only 3 hours away by train, I had never been to the center of the universe, but I was dying to go. There were two options for the field trip: a tour of the United Nations (how boring) or a tour of the “Today Show” set. I knew where I was going. But on the morning of the trip, while the buses idled in front of the school, we waited, and waited, and waited. Eventually we were told the trip was off. (I think it had something to do with liability.) I went to chemistry class completely and utterly bereft. I thought the stages of NBC were forever out of my reach. Knowing I have only four minutes to make a dish that takes about a half-hour, I had to choreograph everything, breaking down each step. Clearly one cataplana, the clam-shaped cooking pot the dish is made in (think of a wok with another on top), wasn’t enough. I hard to order three more from Silampos, a company in Portugal. Last week, The One played director, costume designer, set designer, and personal assistant. I practiced cooking the dish in front of him in real time—meaning the full 30-minute version—making believe I was chatting with Matt, Meredith, Ann, and Al. (Meredith and I had lots to say to each other because she’s also Portuguese, grew up about 15 miles away from me in New England, and her family is from an Azorean island, just like mine is.) 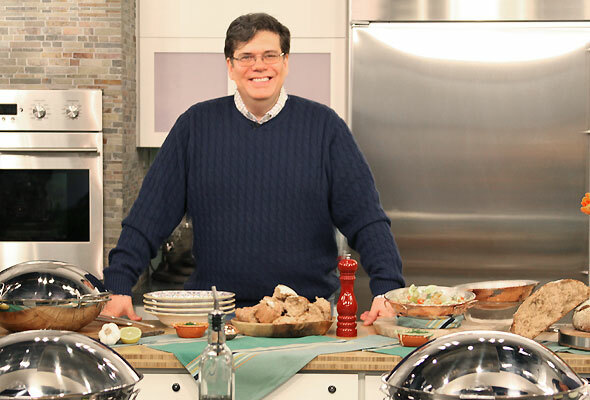 On Wednesday I heard the great news that I’ll appear on the 9 to 10 a.m. hour and was told that Bianca Henry, one of the food stylists on the show who also happens to be half Portuguese, would be working with me. David, i’m so excited for you. You definitely deserve this wonderful opportunity and I know you will make a great impression. My big question is – when you get your own show, can I make a guest appearance???? Thanks. And OF COURSE you can be a guest on my show. Only question: Are you planning to finance that show? Wow!! I am so impressed…I work with a star! Awesome David!! I can’t wait to watch and cheer you on! All the best to you. Thank you, Carol. Much appreciated. Goes to show; never give up on your dreams! Congratulations and best not to worry about the sixty? pounds, you’re just fine. Pat, it’s MORE than 60, but let’s just leave it at that. Thanks for all the kind wishes. That is just so awesome. You will have a great time and you’ll do a great job. Don’t forget step 5: work the website address into the four minutes. RAH! RAH! RAH! David, how very exciting – I’m so happy that you are realizing a long-held dream – go for it and forget the incidentals like weight, hair or whatever—remember Al Roker used to weigh more and it didn’t stop him. I’ll be watching and cheering you on from North Carolina. Don’t forget to tweet from the green room. Congratulations! Will set up my timer. Spanx!! LOL!! Congrats – you’ll be FINE, David – knock ’em dead!! Skyrocketing to stardom-forget the spanx; you are a very handsome man with a wonderful sense of humor! That is wonderful! I will have to Tivo your appearance. You and your recipes have made their way into my heart and kitchen. Congratulations David! You deserve it. Wish I could watch the show but we don’t get it here in Israel. I’m sure you’ll knock ’em dead! Wow, what a coup! Congratulations. I look forward to seeing you live? in the Big Apple! How exciting! Maybe you can visit the United Nations after your Today Show debut?! :o) Congrats and good luck! Thanks, Tasha. I think it’ll be fun. I’m starting to get nervous, though. When I’ve done TV it was live to tape. This…is…live! It’s such a pleasure to see all your hard work coming to fruition in so many positive ways. We’ll be watching and cheering you on, for sure. P.S. Who amongst us really trusts a too thin chef? The big guys are the big guys, n’est-ce pas? Ellen, thanks. If only Momma Leite believed the too thin chef logic. But I’m doing okay. If I keep eating only one grape dipped in low-fat mayo everyday, I should shed about 40 pounds by Monday. Congratulations, David. One of the things I most like about you is your enthusiasm for the good happenings in your life. Wallflowers are much less interesting….and less fun. I’ll take a man who gets excited about an opportunity and says so. It allows the rest of us to be a part of the celebration as well. Being a part of LC lets me vicariously tag along for the ride! Knock ’em dead! You’ll be fine. How can you be otherwise with all of us behind you? Congratulations on plotting and succeeding! David, that is sooo wonderful. I’ll be watching. I normally watch a competitor show at that hour but I’ll watch The Today Show so I don’t miss you. Good luck. Demos look very scary. The dish sounds outstanding. Should be fun to see how you get it done, with all the swap outs, and without passing out from nerves. I wish you a lot of luck. Well, passing out isn’t out of the question! And thanks for switching loyalty for the day. I, and I’m sure The Today Show, appreciate it! So glad it worked out for you. I know you are going to be terrific. Can’t wait to see you! Well, Giuliano, I owe i all to you. David—if you REALLY want Spanx, just ask Jimmy Kimmel and the Handsome Mens Club!! You are perfect just the way you are—so there!! Congratulations—all of us here in Cajun Land will be watching and cheering! Karen, LOL! I just have to have my people call Jimmy’s people to get ahold of a few Spanx. Give my best to the denizens of Cajun Land! Congratulations. I hope everyone watches. I will. Great Job! And the outfit was terrific, the food looked sensational. Read in the Fall River Herald that you would be on the TODAY SHOW. You did a great job. Wished M. Veira had been with you for the Portuguese connection. I have been reading lots of interesting bits about you. I have been collecting Portuguese cookbooks and trying recipes for years. Can’t wait to get yours. Hope you get to meet Emeril, too. Keep up the good work! Mary, thank you! It was great fun. Meredith had an appointment, so she couldn’t make it, but I discovered that Natalie Morales is half Brazilian, so that was cool. Im looking forward to a little Swansea/Fall River, MA downtime this week. I’m going to Al Forno restaurant on Wednesday night for a Cook the Book event. They’re making the cataplana for dinner. Then to a book signing at A Novel Idea on Thursday night, and then quiet time with my parents on Friday, Saturday, and Sunday.